In recent few weeks we have seen many Full HD display devices powered by MT6589T Chipset and each manufacturer has tried to provide something different. Micromax Canvas Turbo provides with Aluminum body design along with various software tweaks, Zen Ultrafone Amaze offered lower price along with enhanced camera specs. 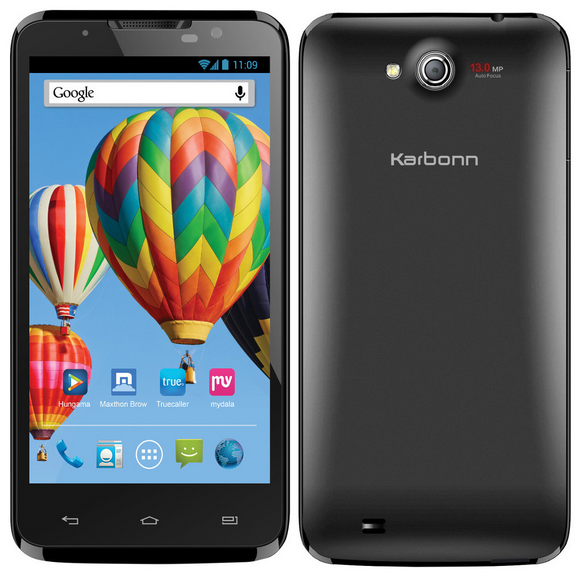 Karbonn has managed to keep the priced as low as 14,999. The Primary camera has a 13 MP sensor similar to all other MT6589T phones. LED flash is also present for low light photography. The front camera has been trimmed down to 2 MP from the conventional 5 MP. This is the perfect place for cost cutting as the front camera hasn’t actually caught up in emerging markets like India, owing to limited use of high speed internet connections. Internal storage is 16 GB and can be further extended to 32 GB using MicroSD card. This is decent amount of storage and gives this phone an edge of 4 GB Quad core devices including its main rival MT6589T powered Micromax Canvas Magnus. As mentioned above the processor employed is 1.5 GHz Quad core MT6589T turbo processor with PowerVR SGX 544MP GPU clocked at 357 MHz. This chipset can’t handle the extra pixels very well while executing gaming apps. The frame rate will be around 30 fps instead of 60 fps attained with 720p HD resolution and thus if you are an aggressive gamer, this phone is not for you. For all other purposes, the processor will suffice.We expect the RAM capacity to be 1 GB, but this hasn’t been confirmed yet. The Battery capacity of this phone has not been specified, but you will get talk time of only 4 hours on 2 G and standby time of 200 hours. This is disappointing and will be deal breaker for many. You will have to throw in extra 1000 bucks for a battery bank. The 5 Inch display comes with Full HD 1900 x 1080 pixel resolution and OGS (One Glass Solution) technology. The OGS technology eliminates layers of glass in touch screen, thus providing with more responsive and brighter display. Full HD OGS display is quite tempting proposition and your multimedia experience will be pretty good. The phone supports dual SIM connectivity and runs on Android 4.2 Jelly bean operating system. This phone will have Gyroscope Sensor, Proximity Sensor, G-Sensor, Light Sensor and eCompass. The looks are quite convention and plastic-ky. The body dimensions are 72 x 143.5 x 9.3 mm which implies it’s not very sleek either. Connectivity features include GPRS, 3G, EDGE, Bluetooth and Wi-Fi. The phone will compete against various other MT6589T phones like Micromax Canvas Magnus, Zen Ultrafone Amaze FHD, Gionee Elife E5, Micromax Canvas Turbo, Intex Aqua i7 and Gionee Elife E6. Most all of these phones will provide you with similar hardware specs on paper. If you are a gamer, this phone is not for you. If you wish to enjoy the privilege offered by Full HD multimedia displays, then this will be a cheaper option but you will have to carry a battery bank with you. The phone will also offer you decent internal storage and option for extendable storage as well. If you can do with HD display which is pretty good on a 5 inch display, there are other options available. Most people think that Karbonn phones are crap, but I bought this phone from MNV Collections recently and I think it is just amazing! It it total value for money. It has an amazing display and a fast processor, which makes it highly responsive. It is perfect for gaming. The only drawbacks about this phone is the 2000mAH battery. And the volume is not too high.